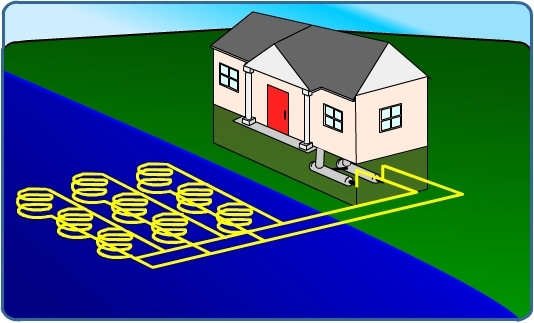 The horizontal type of installation is generally most cost-effective for residential installations, particularly for new construction where sufficient land is available. It requires trenches at least four feet deep. 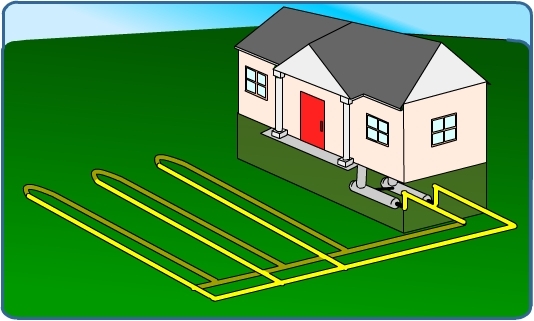 Horizontal systems come in two types of layouts, the two pipes method and the slinky method. Two Pipes Layout (Option 1) - One pipe buried at six feet, and another pipe buried at four feet. Two Pipes Layout (Option 2) - Both pipes placed side-by-side at five feet in the ground in a two-foot wide trench. 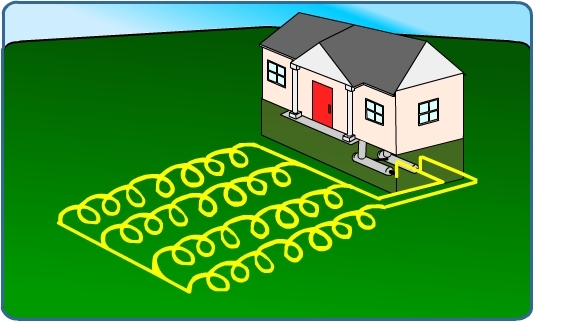 This type of system may be used when the soil is too shallow for trenching or when one does not want to disturb the existing landscaping. 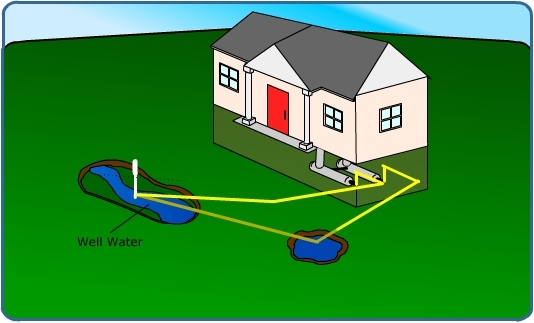 If a home has source surface water, such as a pond or lake, this type of loop design may be the most economical, since there is no need to dig a trench or a well for the pipes in the ground. In this type of system, the fluid circulates through polyethylene piping in a body of water, just as it does in the ground loops. The pipe may be coiled in a slinky shape to fit more of it into a given amount of space. This loop is recommended only if the water level never drops below six to eight feet at its lowest level, to assure sufficient heat-transfer capability. Pond loops used in a closed system result in no adverse impacts on the aquatic system. This type of system uses well(s) or surface body water as the heat exchange fluid that circulates directly through the GHP system. Once it has circulated through the system, the water returns to the ground through the well, a recharge well, or a surface discharge. This option is obviously practical only where there is an adequate supply of relatively clean water, and all local codes and regulations regarding groundwater discharge are met.